Today’s sober readings speak of “sharing Christ’s sufferings” (1 Pet 4:13), while rejoicing; of being “reviled for the name of Christ” (1 Pet 4:14), while blessing; and of not worrying when handed over to the courts to be flogged (cf. Mt 10:17), because how you will defend yourself will be inspired from “the Spirit of your Father speaking through you” (Mt 10:20). Tough words, but also with a consoling edge. These Scriptures bluntly lay out for us the cost of discipleship: what we can expect when we live our calling with fidelity to Christ and his law. There is a real warning here – plain talk. Christians cannot expect to be spared anything that the Lord himself did not experience (cf. Jn 15:20), for “a disciple is not above the teacher” (Mt 10:24). Down through the centuries, countless faithful Christians have faced persecution by the powerful. Thomas More, “a canny London lawyer,”1 was one such man. This great sixteenth-century English scholar and statesman was a model layman who lived the Gospel, like Christ, “to the end” (Jn 13:1). He was a learned academician, an outstanding member of the legal profession and Lord Chancellor of England. 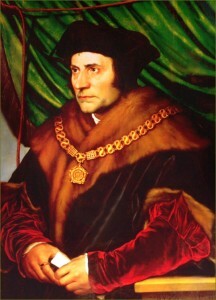 This “man for all seasons” was also a loving husband and doting father, as well as being courageous, humorous and holy in adversity.2 It’s no wonder that St. Thomas More “is admired by believers and non-believers alike for the integrity with which he followed his conscience, even at the cost of displeasing the sovereign whose ‘good servant’ he was, because he chose to serve God first.”3 In order to remain faithful to his own conscience, he was willing to give up everything: honours, affection, and even life itself; but by doing so he acquired the pearl of unsurpassable value, the kingdom of heaven. Among the many questions which touch upon the role of law in society, I would like to voice my concern at our country’s increasing marginalization of religion, particularly of Christianity, even while we pay lip service to tolerance. Some advocate that the voice of religion in public life should be silenced, or at least relegated to the purely private sphere, because they seek to deny religious faith any influence on society. And there are those who argue that Christians in public roles should, at times, be lawfully required to act against their conscience. This occurs wherever laws are promulgated – most often those dealing with issues linked to the dignity of human life from conception to its natural end or the nature of the family – which would limit the right to conscientious objection by health-care workers, legal professionals and educators. Such situations are worrying signs of a failure to appreciate not only the right of believers to freedom of conscience and of religion, but also the legitimate and healthy voice of religious believers in the public square. It is my hope that the traditional mutual respect and cooperation between Church and state, which has characterized Canadian history, will continue to mark our national life. 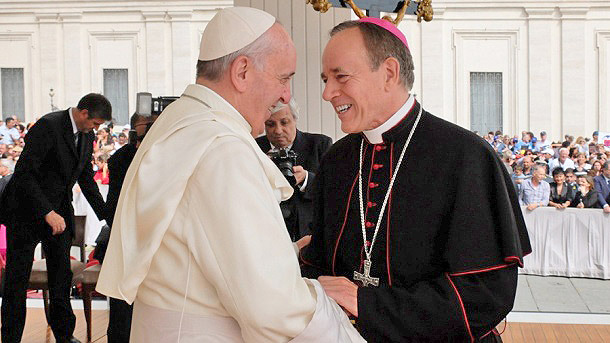 This will be possible, however, only if religious institutions as such – and I include here specifically our Catholic health-care institutions and schools – are “free to act in accordance with their own principles and specific convictions based upon the faith and the official teaching”8 of their respective traditions. Those of you learned in the law have the awesome responsibility of safeguarding the fundamental principles of justice and equity which undergird a humane social order. Undoubtedly there are times when you feel almost overwhelmed by the burdens of your profession, and for that very reason today we want to assure you of our prayers for your success and consolation. Yours no easy task under the best of circumstances. Considering the ruthless secularism that is seizing Canadian life, it is a vocation of justice and mercy that has only grown even more difficult. Fortunately, you are not left alone in fulfilling your demanding duties. This evening, we have gathered to invoke the Holy Spirit who pours forth the love of God into your hearts (cf. Rom 5:5); to pray that you will place yourselves under the influence of the Creator Spirit who is ready to speak through you (cf. Mt 10:20). Recall what Jesus promised his disciples at the Last Supper: “the Advocate, the Holy Spirit, whom the Father will send in my name, will teach you everything, and remind you of all that I have said to you” (Jn 14:26; cf. 16:12-15). The Spirit is with you. He is your great advocate, your defender, your counsellor and your guide along the way. At the beginning of our celebration we sang the ancient ninth-century hymn of Rabanus Maurus, the Veni, Creator Spiritus, “Come, Creator Spirit,” which has been intoned at the Red Mass since the early Middle Ages. Why this hymn? Because the Church understands the complexity of your world, of the climate which envelops the practice of law and the administration of justice. And so, at this Red Mass – whose colour links the blood of martyrdom and the fire of the Holy Spirit with the robes of justice – we stand before this altar to invoke the Holy Spirit: that he will come with his grace and heavenly aid to fill your hearts; that he will kindle a light in your minds to know and honour the truth; and that he will strengthen your conviction that the law is an irreplaceable and morally worthy instrument for attaining a society where justice and mercy will prevail. Like St. Thomas More, may you grasp ever more clearly that your profession is a noble calling which, when lived faithfully and courageously, unites your natural talents with a vision of faith and the force of reason to serve the supreme ideal of justice and the common good.